Cover art featuring Eddie George. Madden NFL 2001 is an American football video game. 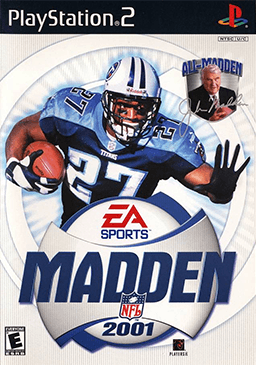 It is the third in the Madden NFL series to include an NFL player, Tennessee Titans running back Eddie George, on its cover (the first being Madden NFL '95, which featured Erik Williams and Karl Wilson along with Madden himself). It is also the first game in the Madden NFL series to appear on the PlayStation 2 game console. This is the first Madden game to feature NFL Europe teams. Madden NFL 2001 includes several customizable modes. Players have the ability to create a play, create a player, run a franchise, and collect Madden Cards, allowing players to perform certain actions during gameplay (for example, adding 5th downs, or limiting the CPU-controlled team to 3rd downs). The cards can also alter individual player ratings, unlock special stadiums, and unlock Hall of Fame and All-Madden teams. Note: Only the PC Version allowed the player to create a team via the rosters menu and the N64, Playstation, and Playstation 2 versions have Madden Cards (297 total). The best teams in the game overall were the Jacksonville Jaguars and the St. Louis Rams with a score of 95. The worst team in the game overall was the San Diego Chargers with the score of 70. The best offense in the game belongs to the St. Louis Rams with the score of 95. A 3 way tie for the best defense in the game belongs to the Tampa Bay Buccaneers, the Baltimore Ravens and the Jacksonville Jaguars with scores of 95. The best special teams in the game belongs to the Denver Broncos with the score of 95. The game also contains 35 Great Games that unlocks the additional teams and stadiums. The game was met with universal acclaim to mixed reception. GameRankings and Metacritic gave it a score of 90.78% and 91 out of 100 for the PlayStation 2 version; 88.65% and 90 out of 100 for the PlayStation version; 84.82% and 89 out of 100 for the Nintendo 64 version; 79.36% and 78 out of 100 for the PC version; and 62% for the Game Boy Color version. Official UK PlayStation Magazine gave the PlayStation version a score of nine out of ten and the Starplayer Award and said that it "expertly mixes arcade action with sim-deep stats and playbooks". In Japan, Famitsu gave the PS2 version a score of 35 out of 40. ↑ Baize, Anthony. "Madden NFL 2001 (PC) - Review". AllGame. Archived from the original on November 15, 2014. Retrieved May 16, 2015. ↑ Melville, Bryan. "Madden NFL 2001 (PS) - Review". AllGame. Archived from the original on November 15, 2014. Retrieved May 16, 2015. ↑ Marriott, Scott Alan. "Madden NFL 2001 (PS2) - Review". AllGame. Archived from the original on November 15, 2014. Retrieved May 16, 2015. ↑ EGM staff (2000). "Madden NFL 2001 (N64)". Electronic Gaming Monthly. ↑ EGM staff (2000). "Madden NFL 2001 (PS)". Electronic Gaming Monthly. ↑ EGM staff (November 2000). "Madden NFL 2001 (PS2)". Electronic Gaming Monthly. 1 2 "プレイステーション2 - マッデンNFL スーパーボウル2001". Famitsu. 915: 59. June 30, 2006. ↑ "REVIEW for Madden NFL 2001 (PS2)". GameFan. November 8, 2000. ↑ Anderson, Paul (November 2000). "Madden NFL 2001 (PS2)". Game Informer (91). Archived from the original on January 22, 2008. Retrieved May 16, 2015. ↑ Wright, Brian (September 1, 2000). "Madden NFL 2001 Review for PC on GamePro.com". GamePro. Archived from the original on February 9, 2005. Retrieved May 17, 2015. ↑ Cheat Monkey (September 1, 2000). "NFL Madden 2001 [sic] Review for PlayStation on GamePro.com". GamePro. Archived from the original on February 12, 2005. Retrieved May 17, 2015. ↑ Human Tornado (October 25, 2000). "NFL Madden 2001 [sic] Review for PS2 on GamePro.com". GamePro. Archived from the original on February 9, 2005. Retrieved May 17, 2015. ↑ Dodson, Joe (September 2000). "Madden NFL 2001 Review (PS)". Game Revolution. Retrieved May 17, 2015. ↑ Maloculus (January 2001). "Madden NFL 2001 (PS2)". Game Revolution. Archived from the original on October 10, 2004. Retrieved May 17, 2015. ↑ MacDonald, Ryan (September 15, 2000). "Madden NFL 2001 Review (N64)". GameSpot. Retrieved May 16, 2015. ↑ Varanini, Giancarlo (September 2, 2000). "Madden NFL 2001 Review (PC)". GameSpot. Retrieved May 16, 2015. ↑ Brown, Greene (August 18, 2000). "Madden NFL 2001 Review (PS)". GameSpot. Archived from the original on February 10, 2005. Retrieved May 16, 2015. ↑ MacDonald, Ryan (October 13, 2000). "Madden NFL 2001 Review (PS2)". GameSpot. Retrieved May 16, 2015. ↑ Jessyel (November 3, 2000). "Madden NFL 2001". PlanetPS2. Archived from the original on February 15, 2001. Retrieved May 17, 2015. ↑ Carle, Chris (September 15, 2000). "Madden NFL 2001 (N64)". IGN. Retrieved May 16, 2015. ↑ Bates, Jason (September 1, 2000). "Madden NFL 2001 (PC)". IGN. Retrieved May 16, 2015. ↑ Blache III, Fabian (August 15, 2000). "Madden NFL 2001 (PS)". IGN. Retrieved May 16, 2015. ↑ Zdyrko, David (October 23, 2000). "Madden NFL 2001 (PS2)". IGN. Retrieved May 16, 2015. ↑ "Madden NFL 2001 (GBC)". Nintendo Power. 139. December 2000. ↑ "Madden NFL 2001 (N64)". Nintendo Power. 136: 108. September 2000. ↑ "Madden NFL 2001". Official U.S. PlayStation Magazine. 2000. ↑ Zuniga, Todd (November 2000). "Madden NFL 2001 (PS2)". Official U.S. PlayStation Magazine. Archived from the original on December 14, 2000. Retrieved May 17, 2015. ↑ "Madden NFL 2001". PC Gamer: 128. November 2000. ↑ Schkloven, Emmett (January 16, 2001). "Madden NFL 2001 (PS2) Review". X-Play. Archived from the original on June 6, 2001. Retrieved May 17, 2015. ↑ Boyce, Ryan (October 26, 2000). "Madden NFL 2001 (PS2)". Maxim. Archived from the original on June 26, 2001. Retrieved May 17, 2015. ↑ Kent, Steve (October 27, 2000). "Game stars light up PlayStation 2 rollout: Of the 26 launch titles, chosen few impress with style, graphics, humor". USA Today. Archived from the original on June 12, 2007. Retrieved May 17, 2015. 1 2 "Madden NFL 2001 for Game Boy Color". GameRankings. Retrieved May 16, 2015. 1 2 "Madden NFL 2001 for Nintendo 64". GameRankings. Retrieved May 16, 2015. 1 2 "Madden NFL 2001 for PC". GameRankings. Retrieved May 16, 2015. 1 2 "Madden NFL 2001 for PlayStation". GameRankings. Retrieved May 16, 2015. 1 2 "Madden NFL 2001 for PlayStation 2". GameRankings. Retrieved May 16, 2015. 1 2 "Madden NFL 2001 for Nintendo 64 Reviews". Metacritic. Retrieved May 16, 2015. 1 2 "Madden NFL 2001 for PC Reviews". Metacritic. Retrieved May 16, 2015. 1 2 "Madden NFL 2001 for PlayStation Reviews". Metacritic. Retrieved May 16, 2015. 1 2 "Madden NFL 2001 for PlayStation 2 Reviews". Metacritic. Retrieved May 16, 2015. 1 2 "Madden NFL 2001 (PS)". Official UK PlayStation Magazine. Future Publishing (64). November 2000.